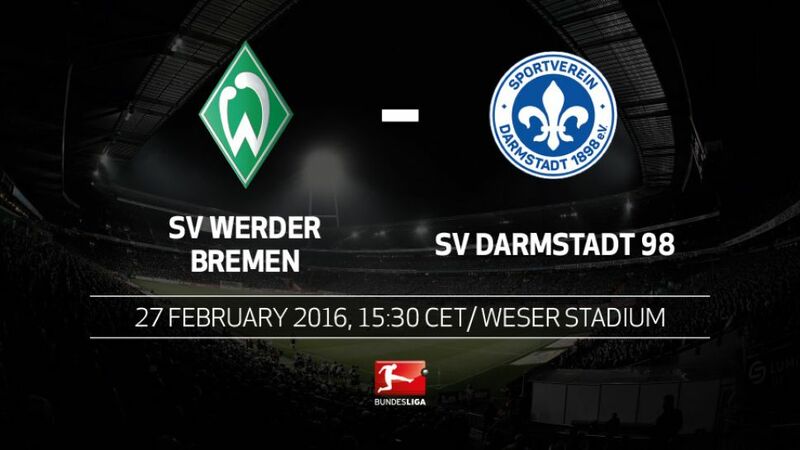 SV Werder Bremen will be aiming to haul SV Darmstadt 98 down into danger and ease their own relegation concerns when the two strugglers meet at the Weser Stadium on Saturday (kick-off 15:30CET/14:30GMT). Werder Bremen's 2-0 loss to FC Ingolstadt 04 last Saturday left Die Grün-Weißen in the promotion/relegation play-off place, two points from automatic safety. Viktor Skripnik's men are struggling to avoid relegation for the first time since 1980, and play host to Darmstadt without a number of first-team regulars, with Philipp Bargfrede and Özkan Yildirim their most notable absentees. Darmstadt fell 3-1 to leaders FC Bayern München last Saturday, though they did so without suspended quintet Peter Niemeyer, Jerome Gondorf, Aytac Sulu, Marcel Heller and Konstantin Rausch. All are set to return, whilst Fabian Holland and Milan Ivana have shaken off groin and knee injuries respectively. Darmstadt's victory in the reverse fixture was their first win over Werder Bremen since May 1979.Werder's current points haul of 20 is the lowest they have ever had after 22 matchdays in the Bundesliga.Bremen are the only team this season who are yet to register a clean sheet. If they fail to keep Darmstadt out on Saturday they will draw level with Borussia Mönchengladbach's record from the 1997/98 season of 23 games without a clean sheet.Werder are without a win in eight games at home - a club record.Wagner's brace in the reverse fixture were his first Bundesliga goals of the season.Only FC Bayern München and Borussia Dortmund have mustered more points away from home than Darmstadt this season.Bremen's 4-4 draw with Darmstadt in February 1982 remains the highest-scoring draw in Darmstadt's history.Werder have lost all three games they have played against newly-promoted teams this season.